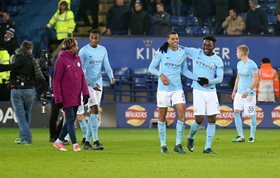 Talented Nigerian midfielder Tom Dele-Bashiru is set to end his association with English Premier League champions Manchester City in the summer, allnigeriasoccer.com understands. The player's camp has revealed that there's no going back on his decision to quit the Citizens, having rejected a contract extension. Dele-Bashiru joined Manchester City at the age of six and has played nonstop at the club for thirteen straight years. He had been one of the stars of Manchester City's Academy teams before getting into the bad books of the powers that be, making his first-team debut against Leicester City in an EFL Cup clash in December 2017. With just one appearance in the last six Premier League 2 games, Dele-Bashiru has been frozen out of the U23 side due to uncertainty surrounding his future. He has found himself himself in a similar situation as Liverpool's Bobby Adekanye, who is not getting games for the club after refusing to sign a new three-year deal.